A superb win for the Chessington 4 squad in the Thames Valley Mervyn Wood Handicap Plate final. Mick Pearson, Brian Windett and Malcom Nicholls stormed back to overcome NPL 1 6-2 after initially being 2 sets down. the victorious Chessington 4 squad of Brian, Mick, Tony Bensberg and Malcolm..
A great win for Brian Windett who overcame Steve Hunt to win the trophy in a tense final . Our thanks to Sue, Raj and Steve for organizing another fun tournament. Steve Hunt presents Don Smith Handicap Cup to Brian Windett. A superb win for Tom Herman who beat teammate Sue Foster to win the trophy in a close fought final between the Div 2 teammates. Our thanks to Sue Foster and Steve Hunt for organizing another fun tournament. 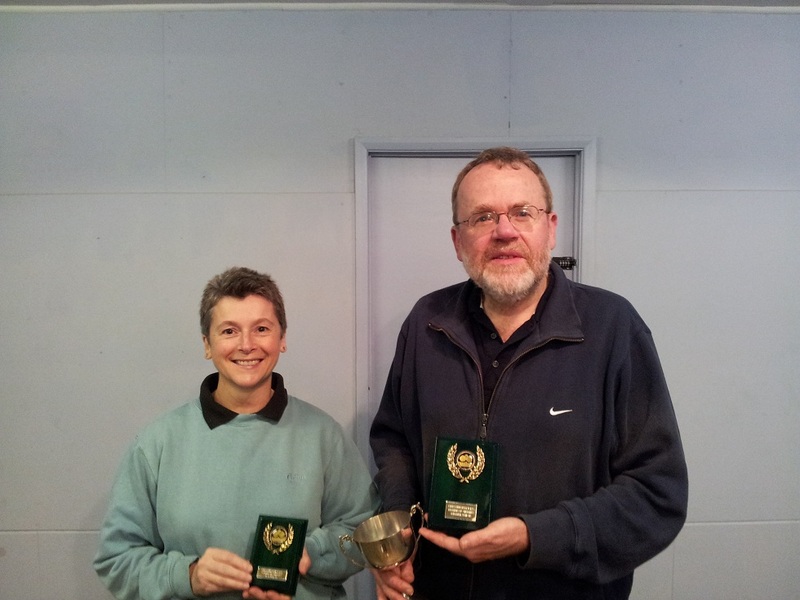 Tom Herman and Sue Foster after the final of the Don Smith Handicap Cup. Congratulations to the victorious Chessington 2 Thames Valley squad, who emerged as winners of the league competition this year. 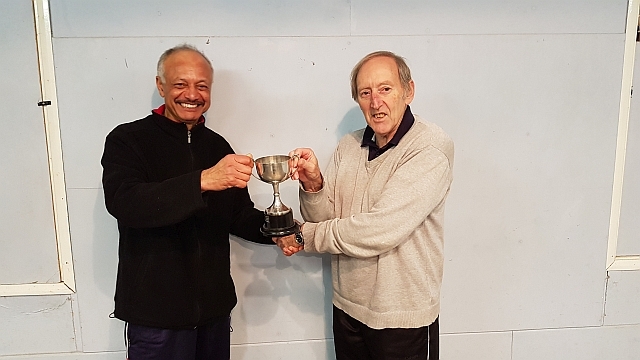 Captain Raj Toofanny and his teammates; Tony Morse, Nigel Randall and Ron Stracey, captured the league title with 11 wins out of 16, gaining 93 points to pip Graham Spicer 4 for the title by 4 points. 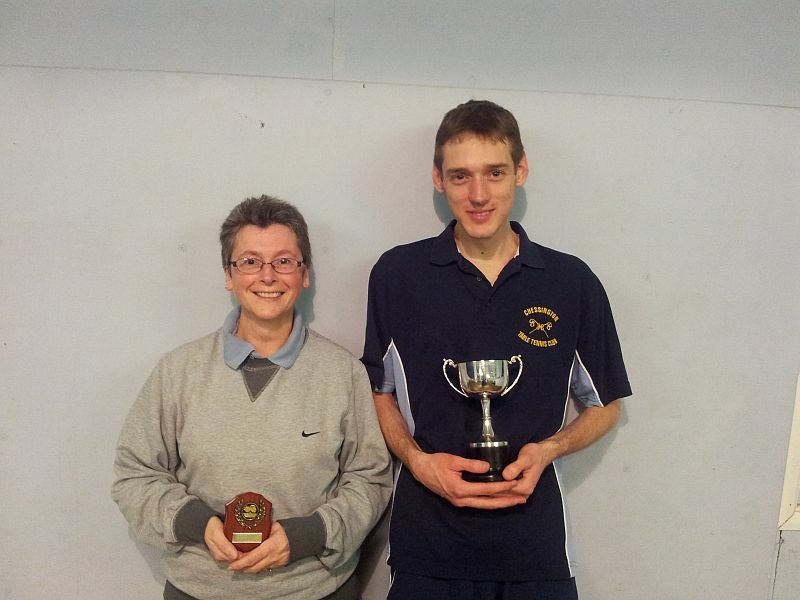 Kevin Allen and Sue Foster after the final of the Don Smith Handicap Cup. Chessington 2 triumph in the 2011 Thames Valley handicap team trophy. 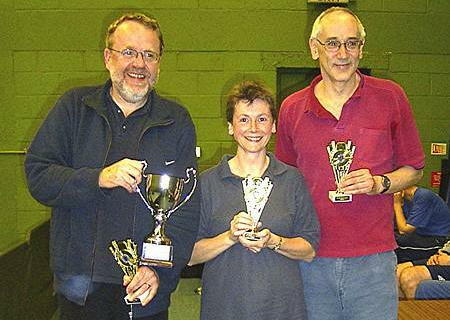 Congratulations to Chessington 2 who triumphed in the 2011 Thames Valley Mervyn Wood team handicap trophy. In the final Chessington ran out comfortable 6-3 winners after a very close first 4 sets had resulted in a 2-2 scoreline. The victorious team of Tony Morse, Raj Toofanny and Ron Stracey after winning the Thames Valley Handicap Cup. Congratulations to Peter Herman who ended Raj Toofanny's 3 year reign over the Don Smith club handicap trophy. 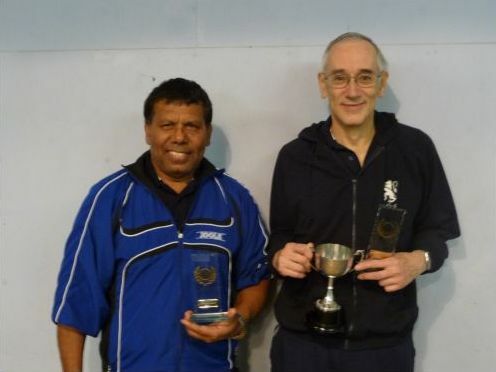 In the semi-finals Peter played superbly to beat an in-form Gary Adkins and Raj was victorious against Steve Hunt. In the Q/Fs, Peter won against Kevin Allen, Raj won against Tony Bensberg, Gary won against Ron Stracey and Steve won against Brian Windett. 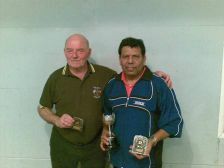 Congratulations to Raj Toofanny who beat Ron Stracey to retain the trophy in a very entertaining final. 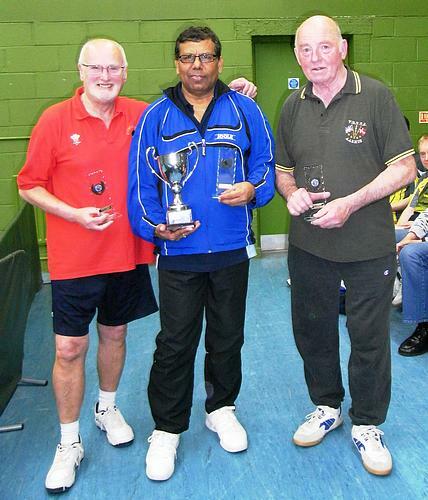 In the semi-finals Raj was victorious against Kevin Allen, and Ron pipped Steve Hunt. In the Q/Fs, Raj won against Gary Adkins, Ron won against Tony Bensberg, Kevin won against Brian Windett, and Steve won against Mike Soopramania. Our thanks to team captains Sue Foster and Raj for organizing what was a very sociable and fun tournament. Atense evening at the Graham Spicer club on Thursday 1 May, 2008 saw Chessington 3's team of Sue Foster, Peter Herman and Kevin Allen claim the Thames Valley Handicap Cup by a score of 5-2 against another division 2 side - Teddington 2. Sue was the key player for the Chessington team, being unbeaten on the night and closing out the vital winning game. 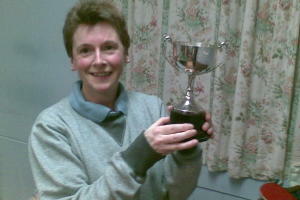 Sue Foster cruised to a convincing win at the club's internal handicap singles tournament held at the hut over the mid-season break. 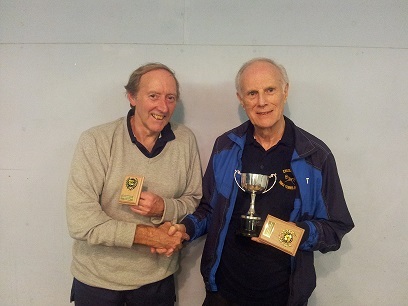 Brian Jones was the runner-up in a closely fought final, losing -17, -20. Click here for results.